Apple has just released its fiscal Q1 2015 earnings, reporting $74.6 billion in revenue, $18 billion in net profit representing $3.06 per share. This is the largest corporate quarterly earnings of all time, above Gazprom, Royal Dutch Shell and ExxonMobil. Compared to the year-ago quarter, it corresponds to a growth of 29.5 percent in revenue, and 47.8 percent in EPS (adjusted for the 7-for-1 split). Fortune’s consensus among analysts was for Apple to report earnings of $2.68 per share on $68.71 billion in revenue, with both revenue and EPS exploding more than 19.3 percent and 29.3 percent respectively — this is an insane growth prediction. In particular, analysts expected iPhone sales to drive the company’s performance. But these expectations were nowhere near today’s crazy quarterly earnings. The iPhone is this quarter’s clear winner. Tim Cook reported during the earnings call that this quarter represented the highest number of new iPhone users and the highest switch rate from an Android phone to an iPhone. Apple’s own guidance from its last earnings release predicted between $63.5 billion and $66.5 billion billion in revenue, with gross margin between 37.5 percent and 38.5 percent percent. Apple’s guidance has been accurate for the past year and a half, with the upper end of the forecast very close to what it actually reported. 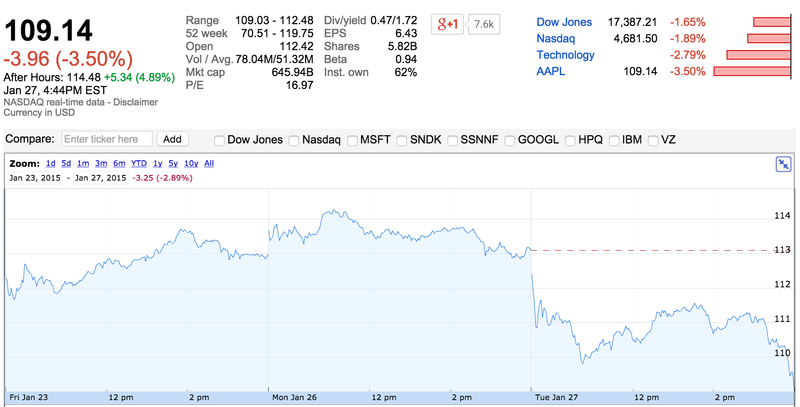 But this time, Apple was too conservative and easily beat its own guidance. This quarter, Apple sold 74.5 million iPhones, 21.4 million iPads and 5.5 million Macs in the quarter. Compared to Q1 2014, iPhone sales grew by 46 percent while iPad sales declined by 17.7 percent. Read all the details about iPhone sales and Mac sales. Many analysts expected Apple to announce that the company sold more iPhones in China than in the U.S. for the first time ever. While the company didn’t break out iPhone sales by region, international sales represented 65 percent of Apple’s revenue, with China representing $16.1 billion in revenue. Read more about sales in China. Minutes after the release, shares are trading at $114.48 in after-hours trading, 4.89 percent above today’s closing price. Apple’s own guidance for Q2 2015 predicts between $52 billion and $55 billion in revenue with a gross margin between 38.5 and 39.5 percent. The company reported $45.6 billion in revenue last year. Don’t expect the Apple Watch to boost the company’s next earnings as Tim Cook just announced that it would be released in April.